Minty Mango Margarita punch! Ahhhh. It’s what’s on the menu today. I don’t think it’s possibly to ever get margarita-ed out. Ever. Last year I made these mango margarita frostys that I loooooooved (and sprinkled with chili powder!). They were super fun to make (…and drink), but I’m so not a frozen margarita person. Unless it’s a million degrees out. I’ve said it a million times, but I’m a rocks + salt girl. In this case, I’m a rocks + salty chili sugar girl. We’ve been on a mango kick here! I’ve been buying pre-cut fruit for us to snack on while the kitchen renovation is happening and we’ve had some of the BEST mango. Max loves it too, even though he can never decide between pineapple and mango. He fights with me daily, calling pineapple mango and mango pineapple. It’s pretty much the cutest thing ever. But anyhoooo… punch for us! Boozy minty mango margaritas in pitcher form for all of your friends! Right here! It’s your one stop shop for alllll the Cinco de Mayo recipes that you need. Let’s chat about your cocktails first. My favorite sangria is this rosé sangria, and I also love this pineapple sangria too. When it comes to margaritas, just HOW do I choose? We have watermelon rosé margaritas, blueberry hibiscus margarita punch, key lime beergaritas, strawberry margaritas AND strawberry-bottomed pineapple margaritas. We have kiwi margaritas, mango jalapeno margs and coconut creamsicle margaritas. 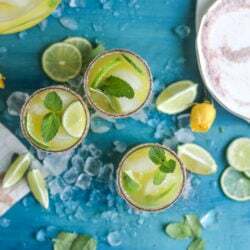 ALSO: mojito margaritas!! And pink grapefruit margaritas. Oh yes. As for snacks, these slow cooker carne asada nachos or green chili beef sheet pan nachos are the best. I have a green chili queso dip and caramelized pineapple, bacon and goat cheese guac. AH! We have crispy carnitas nachos and copycat chipotle corn salsa. I just cannot. Taco time! My current favorite are these slow cooker barbacoa beef tacos. I also love these puffy tacos AND if you’re in a breakfast mood, these summer breakfast tacos! Tomorrow I have another killer chicken taco recipe coming, so there is that. 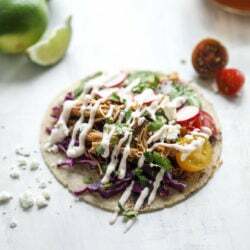 Chicken tinga tacos, weeknight chicken tacos, beer battered fish tacos – there are so many to choose from! These slow cooker short rib tacos and smoky brisket tacos also take the cake. There are a bunch of others over on my taco page, but I’m sure you’re thoroughly overwhelmed at this point. In terms of salads, we have the tequila shrimp salad from earlier this week, the crunchy taco kale salad and a tequila lime flank steak fajita salad. Oooooph. Oh but P.S. ENCHILADAS! Amazing cheese enchiladas, lightened up beef enchiladas, beer braised spicy lime chicken enchiladas. I don’t even know what to do with myself. But you must tell me! What is on your menu? Place the fresh mango and lime juice in a blender. Blend until totally pureed and smooth. It will be a bit thick! If it looks waaaay too thick, you can add some extra lime juice, but remember we will mix it with all the booze and soda. 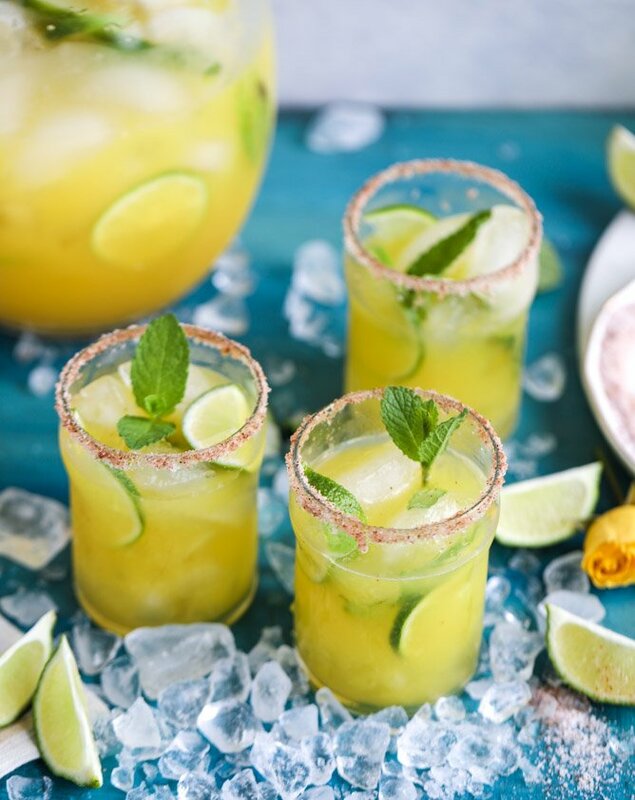 In a large pitcher, stir together the mango puree, tequila, grand marnier, mint syrup and club soda. Add a few lime slices and some big handfuls of fresh mint. Stir. Taste and if needed, add more mint syrup and lime juice. Or tequila! Everyone likes their margaritas differently. To serve, stir together the sugar, salt and chili powder. Rim a glass with a lime wedge and dip it in the chili salt. Fill the glass with ice and pour the punch in! Enjoy. Add the water, sugar and mint leaves to a saucepan and heat over medium heat. Whisk constantly until the sugar dissolves and the mixture comes to a boil. Let it bubble for a minute or so, then reduce the heat and let it cool completely. I’ll usually put it in a bowl or jar, let it come to room temperature, remove the mint and then stick it in the fridge overnight if making it beforehand. Combine sugar, salt and chili powder on a plate and stir well to combine before dipping each glass. These options have exhausted me! I need a taco. 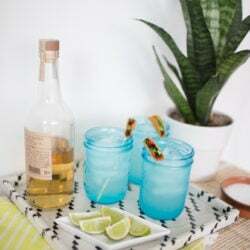 DIY These Taco Drink Stirrers! Beer Braised Chipotle Chicken Tacos. Margarita punch? Yes yes please count me in! Hellooooo Cinco de Mayo drink! This is perfection! These pictures!! They are SO beautiful!! And, of course, they sound ahhmazing! If you’ve got nothing else going on ;) can you please just be my bartender? Clearly, you’ve got my tastes down because yet again, I am ALL over this drink! I think your sheet pan nachos, a margarita, and Netflix might be just about the perfect Cinco de Mayo evening. But how do I choose from all your wonderful margarita recipes? Cheers! Ahaaa ! Mango my love ! Oh my goodness! So much to choose from Jessica, I could hardly pick! I’ll just settle on some minty mango margarita punch, and a round of tofu tacos! These are so pretty and even though its 7:00 in the morning, I just kinda want to go ahead and whip these up! :o ! They totally flip my switch! Ohh I love this! So beautiful and I bet delicious! Too bad that I can’t have it right now, but I will definitely try it next year! I def wish I’d had a pitcher of this for Cinco than what I drank. Ha! I made this for my boyfriend and roommate, and we all loved it! I only used about half of the mint syrup; I can’t wait to use it for another drink this weekend! thank you for sharing. Is the a more perfect combo than mango and mint?? I am dreaming of the weekend when i can make a HUUUUUGE jug of these! I love mojitos but they don’t love me (I drink them anyway :P).